The opposition Rwandan Patriotic Front (RPF) ended the genocide when it entered Kigali in July 1994. It formed a Government of National Unity headed by President Pasteur Bizimungu, bringing together parties that did not participate in the genocide together. Paul Kagame, who had commanded the RPF, became Vice President. Kagame took office as President of Rwanda in 2000, and remains in power today. Kagame is a dominant and controversial figure. He has brought stability to Rwanda, and much work has been done to promote reconciliation between ethnic groups after the genocide. Economic development has been a top priority, and the Rwandan economy has achieved impressive levels of growth. Foreign investment has been encouraged, and international aid donors have generously supported the Government’s efforts. Women’s rights have been consistently promoted, and the Rwandan lower house of Parliament is one of only very few in the world with more women than men. However there are concerns that political opposition to Kagame has been supressed, and there has been criticism of the Rwandan Government’s military involvement in neighbouring Democratic Republic of Congo. Rwanda faces huge challenges from the legacy of genocide, including orphaned children, women with HIV/ AIDS resulting from being raped, and survivors facing disfigurement and trauma. Kagame's government has passed laws against spreading ‘genocide ideology’, including any views that could create division and hatred. People are encouraged to describe themselves only as Rwandan, never as Hutu or Tutsi. In 2004 the Kigali Genocide Centre opened, as a memorial to those who died and a museum to promote reconciliation and awareness of genocide. It was created by the Aegis Trust, a UK-based charity. Over 250,000 people are buried at the centre – a stark reminder of the scale of the 100 days of the Genocide in Rwanda. The Aegis Trust campaigns to prevent genocide worldwide. Aegis activities include: research, policy, education, remembrance, awareness of genocide issues in the media and humanitarian support for victims of genocide. 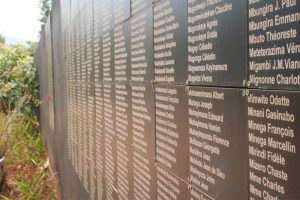 The Kigali Genocide Memorial is the final resting place for more than 250,000 victims of the Genocide in Rwanda. It honours the memory of the more than one million Rwandans killed in 1994 through education and peace-building. SURF was established in the UK in 1997 to assist survivors of the genocide, and works through survivor led partner organisations in Rwanda to address the complex needs of survivors. SURF’s vision is a world where the rights and dignity of survivors are respected, its mission is to rebuild a sense of self and trust in humanity amongst survivors. Survivors Fund can provide resources on the Genocide in Rwanda, and will try to provide speakers for events where possible.